Get a scary Zombie look with these ZOMBIE GREY MAXVUE CONTACT LENSES, to help give you the little extra scare when it come to the biggest event in October. 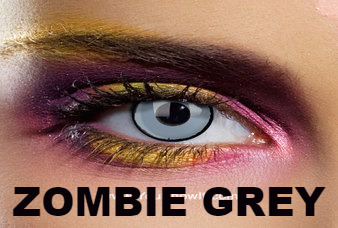 These scary Contacts have a bold gray colour to make you give your eyes that dead zombie look. 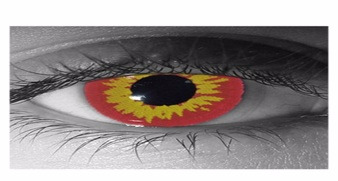 These contacts are suitable for all eyes and due to them being no prescriptive, they won't effect your vision.. You’ll be amazed by how much these zombie lenses can change your overall look and this is a great way to surprise your friends and other with the ZOMBIE GREY MAXVUE CONTACT LENSES. Get everything you need in this kit to bring a completely new colour to your eyes and keep enjoying them for up to 1 year! With also our wide range selection of zombie themes contact like our ZOMBIE WHITE CONTACT LENSES CCL01, which gives you a creepy no pupil eye look or BLOOD SPLAT EYE CONTACT LENSES, which makes it look like your eyes are bleeding and dead, this is perfect for halloween due to the fact it ads more to your costume and the fake blood appearance + MANY MORE..